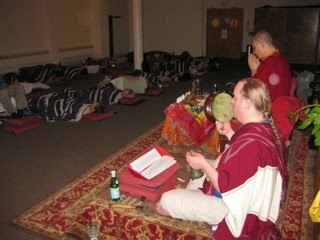 Recently I assisted one of my principal teachers, Lama Migmar Tseten, in the performance of a two day Healing Chö ceremony at Kripalu, in Lennox, Ma. The fundamental method in the Healing Chö is that a patient comes and lies down in front of the Chöpa, who recites the Chö liturgy in addition to using some autochthonic rites grouped under the term gto. The use of the these rites can be complicated or simple, depending on the choice of the ritual master and requirements of the situation. During the recitation of the liturgy, the Chöpa performs the visualization of Chö on behalf of the participants in the rite. My first contact with Healing Chö came on the occasion of meeting my precious root guru, the late Mantradhara Yeshe Dorje for the first time in 1992. The first evening he was there, he performed a Healing Chö in order to remove obstacles of the people present. I had no idea what he was doing, and he did not explain anything. But we all lay down, and he performed the ceremony of Chö on our behalf. One can easily read more about Chö. Since it is easy to receive instructions on the practice Chö these days, I won't go into any more detail about Chö here, apart from saying that a critical part of Chö is about paying back karmic debts one has incurred to negative spirits who act as obstacles and cause illness. Of the four hundred and four illnesses classified in Tibetan Medicine, one hundred and one of them are caused explicitly by demonic entities called gdon. The term gdon, according to Chogyal Namkhai Norbu, also carries the meaning of doubt as in the common phrase gdon mi za ba "without doubt". In general, these diseases cannot be cured with medicine alone, though there are many herbal preparations which can assist controlling their negative effects, for example, the famous Vimala preparation was originally created by Master Vimalamitra to control the effects of Gyalpo spirits (pictured being trampled by Dorje Drollo's mount, to the right). Also, the incense known as gugul is burnt in order to repel negative spirits from one's space. "Thousands of tiny little creatures,” he said, “some on horseback, waving arms, carrying weapons like some grand Renaissance battle,” were trying to turn people “into zombies.” Their leader was a woman “with no mouth but a very precisely cut hole in her throat(link). Spirits: [fevers] are caused by arising from the central eye of Shiva and from the cursing and fighting between matrikas and ḍākinīs (two types of female spirits). There are many other gdon which are indicated in a whole range of illnesses. From the perspective of Tibetan Medicine many people are afflicted by gdon and are never treated for it properly, nor are they protected against it. In the article above, it states that many folks who are struck by the kind of delirium described above, never completely recover. In most instances, from our perspective, many of these conditions could be alleviated with proper rituals done correctly. At our Healing Chö, people reported amazing results, such as the vanishing of long-term persistent physical pains from injuries, lifting of depression, enhanced feelings of well-being and so on. It is said that while such rites seem like child's play, they are extremely effective. My intent here is not to advertise our Healing Chö ceremonies, but to point out to people that ritual plays an extremely important role in Tibetan Medicine, and should be used to address and remedy that part of illness that is often left unattended i.e. the role of spirits in causing or prolonging illnesses. It is tempting to write off the hallucinations of delirious persons as purely being caused by the heat of fever. But from our perspective, such experiences as those reported above in the news article, prove the vital need for people to look at deeper spiritual causes for their states of disease. Malcolm this makes me even more want to participate in the Healing Chod at Kripalu in Sept. Will you be at that even though teacher is different? I've actually be told by an Ayurvedic astrologer that a particular ailment is karmic, meaning in this context, that "regular" cures and treatments won't help! Yes, I will be doing the chö in September too. We just finished one last weekend that was quite well attended. I have heard that these rituals can be effective at a distance. Is this the case and can a woman with inflammatory breast cancer who lives across the country benefit? What must one do to sponsor this person to participate in this ritual? You would need to send a picture that had a piece of hair etc. attached. Hope this post is okay. 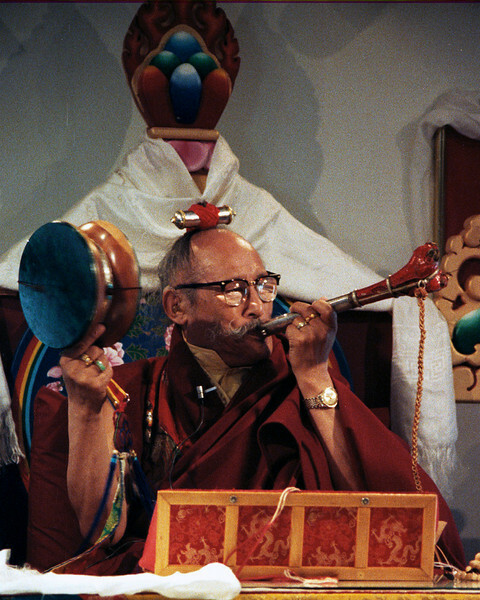 Another ngakpa (who was also a disciple of Ngakpa Yeshe Dorje Rinpoche) who does Healing Cho and also Dur Ceremonies is Ngakpa Karma Lhundup Rinpoche. His Cho is the Dudjom Troma Nakmo Cho. He is part of a small ngakpa community in Dharamsala. He has a compassion that is humourous and sets people at ease. He travels and teaches in USA, Europe and Australia. He can be contacted via email for ceremonies and remote Chod practices. Hi, I want to do Chöd, but it can't be learned from a book, right? :-/ (I'm sure it can't)... I have received transmission from Namkhai Norbu several times, but I am just a crappy student. I actually have a physical situation that I know is affecting my ability/desire to practice (or do anything, really). Keep trying to find practices I can relate to that might help. I want to do Garuda, but don't know how. There are a few books on Chöd, though. Incidentally, you mentioned the use of picture and hair for remote Chöd healing... that reminded me: do you know why they cut a piece of your hair during refuge ceremony? I took refuge with Tsering Everest, but since receiving Namkhai Norbu first and again afterward and realizing Guru Yoga keeps all commitments, I rarely practice Red Tara anymore. Is my hair burning in hell somewhere? ;-) Seriously, what's with the hair chopping?